September 30, 2001 Robert Stevens begins to feel ill.
October 2, 2001 Patriot Act introduced in Congress. October 3, 2001 Tom Daschle, Majority Leader, announces that he doubts the Senate will take up the Patriot Act on the one-week timetable Bush administration has requested. October 3, 2001 Stevens is confirmed to have anthrax. October 4, 2001 Pat Leahy, Chair of the Senate Judiciary Committee, accuses the Bush administration of reneging on an agreement about the Patriot Act. October 5, 2001 Stevens dies. October 7, 2001 The building where Stevens worked is shut down after anthrax spores were found on the keyboard of his computer. October 9, 2001 Postmark date for higher grade anthrax letters mailed to Tom Daschle and Pat Leahy. We need to improve our – some of our law enforcement procedures, and we’ve got legislation pending before the Congress, for example; it’s important we get that through. Every day that goes by when we don’t have all the tools we think we need to find out who these people are and to run them to ground is one more day when we could conceivably suffer the consequences of undue delay. Call your congressman and senator, tell them that’s important legislation, you’d like to see it passed. October 14, 2001 Known cases of anthrax at twelve individuals, mostly skin infections and arising from the September 18 mailings to media outlets. Lots of media attention. October 24, 2001 House passes Patriot Act by vote of 357-66 with 9 representatives not voting. A breakdown of the votes can be seen here. October 25, 2001 Senate passes Patriot Act by vote of 98-1, with one not voting. Russ Feingold was the “no” vote and Mary Landrieu was the Senator who did not vote. There was no public debate in either the House or Senate. 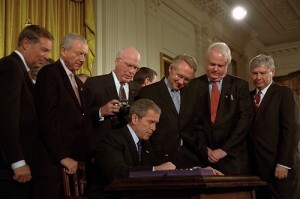 October 26, 2001 Bush signs Patriot Act. Judy, Judy, Judy (and William Patrick) I want to return to the role of Judy Miller. Recall that she published the article disclosing Project Bacus one week prior to 9/11. Part of the reason for publishing that article and several more on the topic of bioweapons was that she and two co-authors had written a book, “Germs: Biological Weapons and America’s Secret War”. The publication date of the book was October 2, 2001. One of her primary sources for writing the book was William Patrick, who had headed the United States’ offensive bioweapons research in the 1960’s at Fort Detrick (yes, the same Fort Detrick where Bruce Ivins worked later). It is clear from Miller’s writing that Patrick was a consultant to Project Bacus and almost certainly was the source of information for weaponizing anthrax and anthrax simulants during this time. In association with the publication of the book, Miller and co-author William Broad also participated in a one hour episode of the PBS science series Nova, which aired November 13, 2001. There is a very chilling interview with William Patrick published in association with the program and there is even video of Patrick dispersing a cloud of an anthrax simulant. In the interview, Patrick discusses his disagreement with Richard Nixon when Nixon unilaterally cancelled offensive bioweapons research in 1969. That was how we met. Bill Broad, a science journalist and then my colleague at the New York Times, and I went to see him in 1997 at his comfortable home atop a wooded hill in Frederick, Maryland, not far from the government bio-lab where he had worked for over 35 years. As we sipped tea on his porch and munched sandwiches prepared by his wife, Virginia, his dog, Billy the Kid, tried snatching chips from our plates. Strains of classical music filled the air and hummingbirds buzzed above the bird feeders he and Ginny had set at strategic spots on the terrace. Then this seemingly cheerful father of two led us downstairs to his basement office, as he had legions of other students of the black bio-arts, to give us a PowerPoint tutorial on how germ weapons were made, stored, and distributed. He patiently answered our questions about how bacteria, viruses, and other deadly pathogens could be used as weapons of mass destruction. Near the end of our session, he pulled a garden sprayer out of a green duffel bag and vigorously pumped it several times, producing a large cloud of fine particles that hung in the air like fog. If this were anthrax, he told us, we would all soon be dead. Offering me a memento of our class, he put a vial of the simulated anthrax in my purse and scribbled his home number on the stationery of his one-man consulting firm, Biothreats Assessment. It was topped with an image of the Grim Reaper. A skull and crossbones were engraved on the business card he handed me. Call any time, he said merrily. As I washed my hands and tried to dust off the powder that clung to my pants and shoes, I thought about what Bill Patrick, my friend and bio-weapons mentor, had told me: anthrax was hard to weaponize. To produce a spore small enough to infect the lungs took great skill. Bill knew that firsthand. He had struggled to manufacture such spores for the United States in the 1950’s and 60’s as a senior scientist in America’s own germ weapons program, which President Richard M. Nixon had unilaterally ended in 1969. The other cases, Bill told me, could well have involved a larger spore that was cut with baby powder or another substance to mask the deadly pathogen with a smell that was reassuringly familiar. Anthrax itself had no smell. And it was almost never white. By now, I was no stranger to this deadly agent. My education had started with Bill Patrick’s demonstration of how easily anthrax could be slipped past airport security. Bill had shown me how the fine powder in the small vial he kept on his desk dissolved like magic into the air when the vial was shaken and poured. In general, Miller’s article is a personable account of the fear generated by a potential anthrax attack and how the average person would respond. The problem with this narrative, though, is that Miller should have been far from the average person. She had been researching bioweapons for several years as she wrote her book. She had known Patrick for about four years at the time she received the letter. She had seen his demonstration of how weaponized biological agents can disperse in air. She even had her own vial of simulant as a reminder. And yet, she “tried to dust off the powder that clung to my pants and shoes”? This is the worst possible thing she could have done if the material in the letter had been real anthrax of the quality received by Daschle and Leahy, as it would have dispersed even more spores into air in an enclosed building. Even if the emergency personnel who responded to the office hadn’t realized it, Miller should have known that her clothing should have been in the bag that was used to remove the letter and recovered powder. Did Miller know before she received it that her anthrax letter would be a hoax? Oh, and one more point. Miller noted that Patrick had told her that anthrax spore preparations are “almost never white”. Here’s a photo of the white powder from the Leahy letter (the powder in the Daschle letter was identical) alongside the more yellow powder from the New York Post letter. Miller published this account of the hoax letter on October 14, one day before the white powder in the Daschle letter was found. So, yes, Judy and Bill, anthrax spore preparations are “almost never white”, but when they are, it’s pretty darned important. “almost never white”, the exception to that rule being when real professionals are the ones making it. And, your timeline left out (A) the death from anthrax of the older woman in Connecticut, who received mail that (was probably cross-contaminated when it) was routed through the NJ mail sorting center through which the anthrax letters passed on their way, and (B) the whereabouts of Dr. Skull-and-Crossbones BusinessCard in September and October 2001. Like whether he made any sudden overnight trips to Princeton or anything, from his place near … where Ivins lived. Not that anyone investigated that. @scribe: Yeah, I left a lot of the other cases out of the timeline. I wanted this one to concentrate primarily on events that I think were the most closely related to the pressure to pass the Patriot Act. The older Connecticut woman died around a month after the bill passed. I don’t know that I would expect Patrick to have been the one to actually mail the letters. I see him more as a key enabler of the team that was responsible. The problem with this narrative, though, is that Miller should have been far from the average person. I think you are assuming that Miller was capable of applying the things she learned in the context of researching a book to her personal actions under pressure. I don’t really see any evidence that she is capable of integrating information acquired in her professional pursuits into her larger worldview. I’m not joking or trying to insult her, but if you look at the things she has reported in her career and compare that to the things she says she believes, she’s a real enigma unless you assume that she compartmentalizes her life. @WilliamOckham: Yes, I do argue from the point of view that she should have had at least an inkling of what was at stake with the powder from the hoax letter. I base that in large part on how striking Patrick’s demonstration of the “smoke clouds” he could generate from weaponized bacteria is. That lesson should get through even the densest thicket of aspens. And she even admits that she was thinking of Patrick (and presumably what he tried to teach her) while this was happening. A major role the anthrax attacks played in the passage of the Patriot Act was in shutting off Congress from the citizenry: I learned of the letters sent to Sens. Leahy and Daschle beause I was calling members of the Judiciary committee at behest of ACLU, which did absolutely heroic work during those weeks in digesting the bill, highlighting the worst abuses*, and organizing pressure to stop/mitigate them. After the letters, Congressional offices were empty for most of a week, and mail was not delivered for some time. So faxes [who knows if anyone ever read them] and in-person lobbying were the only options. *This work was probably made easier by the fact that the bill was a laundry list of power grabs that the govt had been seeking for a long time — as the late Robt Novak said on TV in a moment of candor the week the bill was introduced. @Nell: Thanks for mentioning that, Nell. An important point. @Nell: Wasn’t a lot of what the PATRIOT Act eventually turned into law already in a bill that the Clinton administration proposed after Oklahoma City and that the Republican Congress then wouldn’t pass? @lysias: Yes. Some of the history of the early versions is covered on the History Commons link in the post. And to Nell @5: The inability for people to contact their congresspeople was indeed a hindrance. This became especially creepy when coupled with the total absence of public debate in either chamber. However, one more factor should be taken into account. As mentioned by lysias, versions of the legislation already were in existence. Pushing it through right after 9/11 was a Shock Doctrine move, taking advantage of a general population still reeling from the simultaneous attacks and being a bit more willing to go along with the government without asking questions than normal. @Nell: To echo EW, yes, thanks for that. 9/11, however horrible it was to those involved and those witnessing it, was the excuse for an unprecedented power grab that Cheney and his acolytes had been fantasizing about for some time. It fits to a “T” Naomi Klein’s description of how its private sector correlate grabs unprecedented economic power in the midst of natural or man-made chaos. In part, it’s because the Right have planned for it for years and is just waiting for the right circumstance to appear. Using Cheney as just a stellar example, he had been planning for more than 25 years to regain the executive power he thought Nixon had thrown away by resigning ahead of being thrown out of office. That was in 1974. His Iran Contra “minority report” was in 1987. 9/11 was nearly fifteen years later. The point is that such grabs for unprecedented power are lifelong efforts by Cheney, his peers and their network. One of the nastier effects of Mr. Obama’s failure to look back in anger or righteous retribution for crimes against us, apart from seriously undermining the rule of law and empowering an already powerful elite that slips in and out of govt and the private sector at will, regardless of the party in office, is that he allowed those in Cheney’s network to remain in offices throughout the federal govt as long as it suited their interests to remain there. It’s another aspect of his rush to institutionalize, to make permanent, the fouler aspects of the CheneyBush administration. The New York Times ran a long article today under the title “How Ready Are We for Bioterrorism?” It goes into excruciating detail on the internecine squabbles among government agencies regarding preparedness for bioterrorism (and in some cases, outbreaks of new contagious diseases). The take-home is that political considerations are trumping both science and practicality, as the Obama administration is now preparing to throw its lot in with an effort to develop drugs that treat multiple biological agents as its primary biodefense effort. That is pure scientific puffery and is meant to dress up the fact that there is insufficient funding for any realistic scientific efforts aimed at development of vaccines or targeted drugs for each of the main biological agents that are thought to be threats. In contrast, I am carefully watching a difficult situation today in Fort Worth where competition for the day has been cancelled at the Appaloosa World Championships because one horse has come down with symptoms consistent with the equine herpes virus that killed 13 horses after an outbreak at a cutting horse event earlier this year. The Will Rogers Memorial Center and the Appaloosa Horse Club reacted very quickly to the sick horse and instituted protective measures while awaiting tests to confirm the nature of the sickness. Our family used to show Appaloosas, so we have many close friends at this show. We now show Paints, and the Paint World Championship is scheduled to move into the same facility next week once the Appaloosa event concludes. If the virus is confirmed, word is that the remainder of Appaloosa show will be cancelled, as will the Paint show. The quarantine time for the virus is three weeks, so it is possible the horses there won’t be allowed to leave during that time. It strikes me that this strict quarantine procedure is modeled very closely on the quarantine procedures that were instituted during the period when smallpox virus was in the final stages of being eradicated. A compelling history of those efforts can be read in Robert Preston’s “Demon in the Freezer”. Bottom line: if the government would stop having inter-agency battles and put a little horse sense in place, we’d be in much better shape for next bioterror attack or outbreak along the lines of what was feared for the H1N1 virus. Update: The horse tested negative for equine herpes, so folks are beginning to breathe a sigh of relief. Let the show go on! Bri2k on The Debate We May Be Having Tomorrow: If Trump Obstructed Justice to Hide Compromise by Russia, Could that Be a Crime?